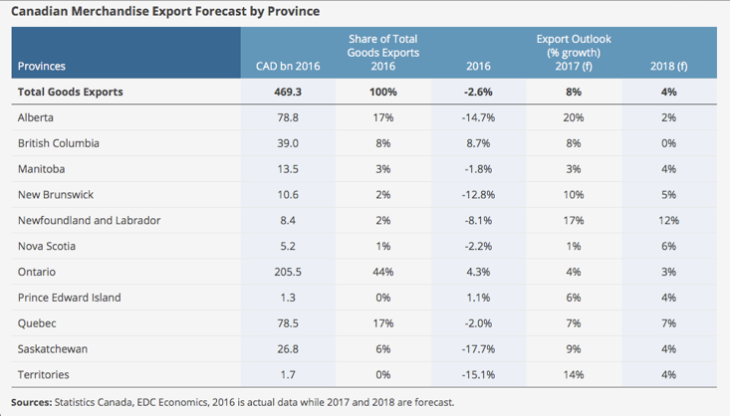 2017 was a remarkable year for Canadian exporters with 8% export growth, led by massive gains in the commodity space. 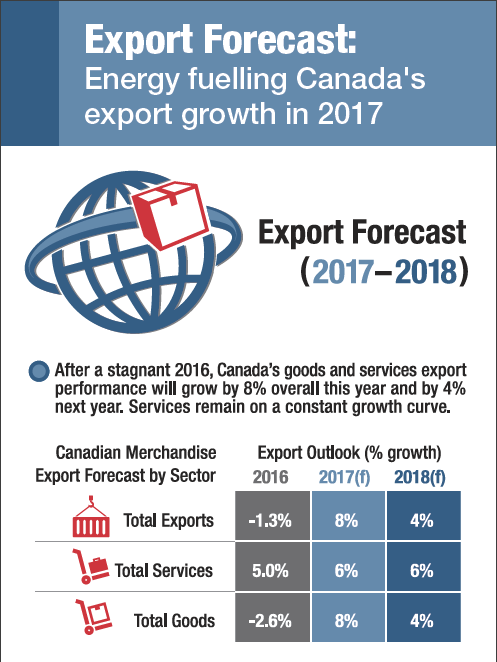 The energy sector had the greatest impact on the value of Canada’s merchandise exports in 2017. 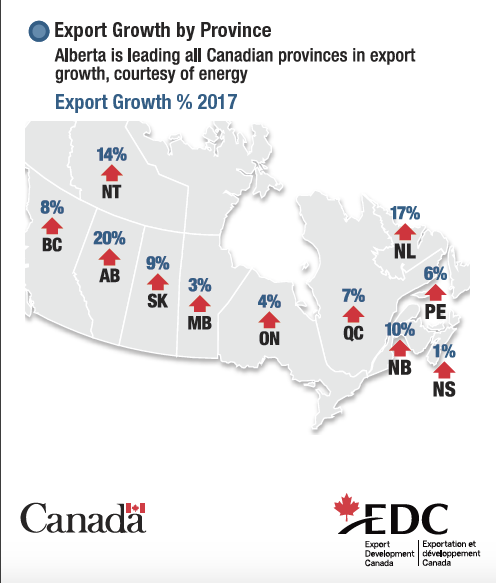 Standing at CAD 77 billion and forecast to grow by an astounding 31%, energy is the key driver of overall export growth for Canada. 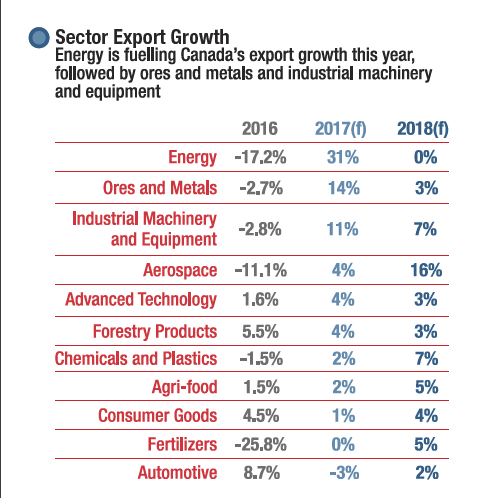 Total export growth including energy stands at 8% in 2017. While Alberta will experience the bulk of this growth, Newfoundland and Labrador will also reap the benefits of the Hebron project producing first oil. Canada’s energy-producing provinces are benefiting from an oil price rebound and price stabilization well above levels seen in early 2016. Production is resuming and increasing as projects initiated before the collapse in oil prices come onstream. 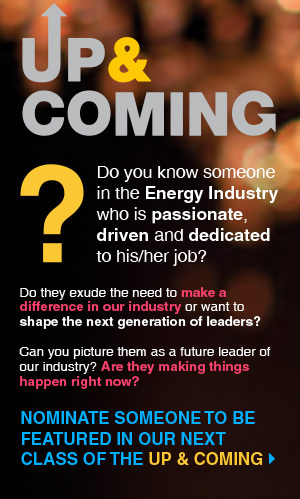 Overall the Canadian energy industry is looking up. In Alberta, there is a strong recovery in oil exports from a year ago when wildfires curtailed output. Newfoundland and Labrador will also see double-digit export growth as the offshore Hebron oil platform are expected to begin operations at the end of 2017 and Vale’s Long Harbour processing facility begin ramping up production. Here at The OGM, I had the privilege of interviewing the esteemed export expert, Peter Hall. Peter joined Export Development Canada (EDC) in 2004 and brings with him over 25 years of experience in economic analysis and forecasting. Peter is responsible for overseeing EDC’s economic analysis, country risk assessment, and corporate research groups. In addition to preparing strategic advice for senior management at EDC. Peter confirms that the climate for exports is on the rise and Canadian companies should be aligned with globalization and export returns. 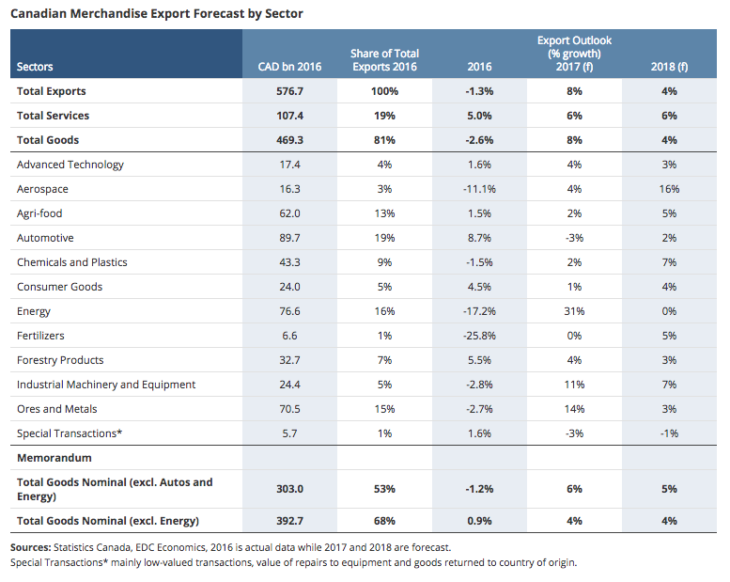 The OGM: What do you expect in terms of export and growth in 2017/18? Peter Hall: We are still benefitting in 2017 from the rebound of commodity prices in the energy sector. They hit their floor in January of 2016 and have made their way up from there. There are a lot of things that don’t happen instantly when something like that occurs. Average pricing is really a big factor in terms of the double-digit increases we see in 2017. Carrying forward, what we see next year, is projects that were on hold during this period were not actually cancelled. That’s the kind of thing that can happen when you get a major shake-up in oil prices like we had. Because those who are assessing projects are asking what is viable and what can be done, typically what we see happening is parties get around the table and look at contract prices and declare that there’s no way to make it work. That crisis kicks off a different conversation. Those who were depending on income streams from energy contracts find room to rewrite those contracts, making concessions and ultimately making the project work, because it’s a case of either doing some business or no business at all. So all these doom and gloom stories we saw in the press, about how everything is in a tailspin and everything is a catastrophe is not the ultimate reality. It’s quite the opposite. Time and time again we have seen how the oil industry gets back on its feet and creates new opportunities and rapid rebound numbers. The outcome is that oil and gas companies are actually making money on much lower world oil prices, and are recovering decently. The OGM: What are the key factors that are contributing to this recovery? Peter Hall: The old adage says that necessity is the mother of invention. And that has been true with the oil price drop. It’s what leads us to innovation. But when you plunge into crisis-pricing you get something even better – you get transformation. The transformation we are seeing includes viable supply chain options, increased innovation and advances in technology, and capitalizing on the new digital economy. A past example of a critical innovation is the development of horizontal drilling techniques that lowered costs and optimized wells in unprecedented ways. 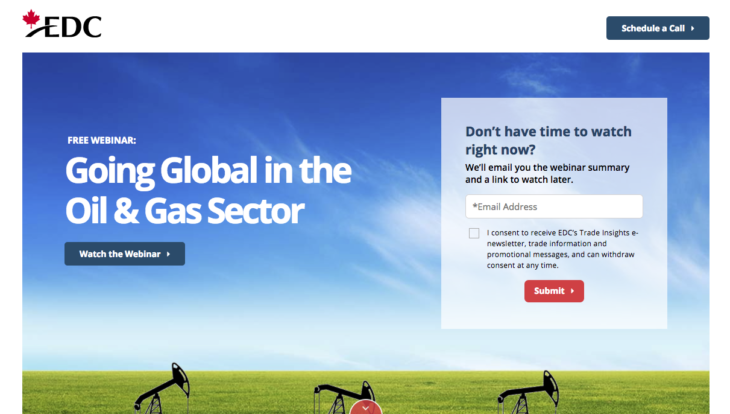 The OGM: What is the export potential for energy companies and suppliers? Peter Hall: While growth has struggled for many years beyond the last recession, we see a world that has huge oil demand. We forecast that activity is on the way up and the global economy is in true recovery. Evidence of pent-up demand exists in the United States and Western Europe. Emerging market populations may not all be growing, but hundreds of millions are getting wealthier, bringing a large boost to global demand. These are all factors. As well there is a re-inclusion of sectors of the population that have been left behind because of meagre growth in the post-recession years. Given all these factors, the growth that is budding in the US, Western Europe, and key emerging markets suggests that prices in the oil sector could actually be more robust than we expect them to be. Our forecasts show sustained growth over the next five years. The OGM: How does globalization impact economics? Peter Hall: I believe that one of the biggest impacts is an exaggerated business cycle. Globalization and technological advancement have produced longer longs, higher highs, and lower lows in the world economy. The problem with this is understanding exaggerated business cycles. It has taken a long time to include or re-include the Great Recession’s displaced workers. At long last, that’s happening. The US and Western Europe are indicating declining unemployment rates. Better yet, in the United States, we are seeing an about-face in jobs for millennials, which will greatly stimulate the economy. The reality is, the confidence in the United States economy is at some of its highest levels ever. In the US and Western Europe, these are the greatest times since the great recession. That’s a good news story for oil demand overall. We’ve been waiting seven years for a true recovery, and I believe it is here now. And better times are ahead. We predict that this growth cycle could last anywhere from 3-8 more years. Some people may call me wildly optimistic for saying that, but if you accept the notion of exaggerated economic cycles, it’s easier to understand my perspective. Learn more about going global in this informative, free webinar!